Architecture that is meant to have a sensuous connection to life calls forthinking that goes far beyond form and construction. 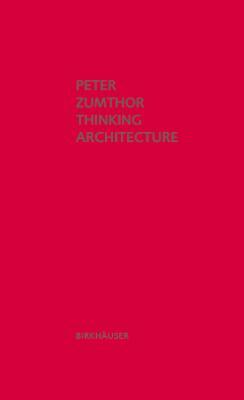 In his texts, Peter Zumthor articulates what motivates him to design his buildings, which appeal to the visitor's heart and mind in so many different ways and possess a compelling and unmistakable presence and aura. Now in its third edition, this book has been expanded to include two new essays: "Architecture and Lanscape" deals with the relationship between the structure and its surroundings, with the secret of the successful placement and topographical integration of architecture. In "The Leis Houses," Peter Zumthor describes the genesis of two wooden houses in the town of Leis in the Swiss canton of Graub nden, thus thematizing the special challenge of integrating contemporary architecture into a traditional architectural context.